These unique markers in a variety of brilliant colors are a safe, easy way to add your own unique style to clothing and accessories. Simply apply the marker ink to cotton or polyester fabrics, then toss the garments in a clothes dryer to heat-set the design. Recommended for age seven and older. 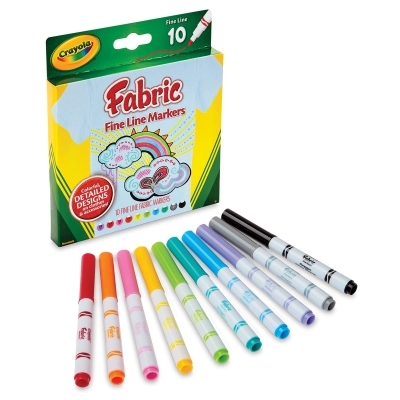 Fine Line Fabric Markers, Set of 10 — Includes Black, Red, Yellow, Blue, Pink, Teal, Lime, Gray, Orange, and Lavender. 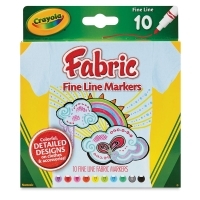 Classic Fine Line Fabric Markers, Classpack of 80 — Includes eight each of Black, Blue, Gray, Lavender, Lime, Orange, Pink, Red, Teal, and Yellow.